If anyone knows St. Norbert College inside and out, it would be Katie. 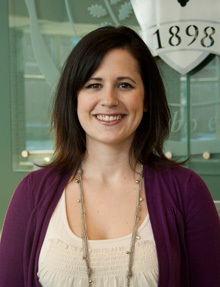 She’s been calling St. Norbert home since she first arrived here as a freshman in 2001. As a proud St. Norbert graduate, Katie can share a piece of SNC life from not just the perspective of a student, but of an alumna and faculty member as well. Katie was a member of the communication faculty here for four years. She was also a teaching assistant at a large public university while earning her master’s degree, and says she couldn’t wait to return “home” to the small liberal arts environment of St. Norbert. Katie loves the abundance of opportunities for student involvement on campus. She knows that the 70+ student organizations provide more than a social outlet. They also develop leadership skills and are such an integral part of the residential college experience. She recommends that you learn about campus life at SNC and immerse yourself.